Dr. Deming developed many experiments that he used to portray the truths of his theories. None has had as much impact on his audience as the one he called “a stupid experiment, that you will never forget.” The Red Bead Experiment has a way of creeping up on you. It starts out innocently enough, as workers, inspectors, a master inspector are chosen from the audience. Dr. Deming reserved for himself the position of foreman. The job was to make white beads. The workers did this by drawing 50 beads at a time in a specially made “scoop” from a bin with white beads and some red beads. This is all great fun, with workers drawing differing numbers of red beads, each draw recorded on a control chart. After each round Dr. Deming would start his tongue in cheek berating of the employees that drew the most red beads. At the same time he heaped praise on the workers that drew the least. This goes back and forth as Deming had to withdraw his praise from workers who “lost” their positions to other workers. The lesson of the Red Beads is very powerful. Summed up, it is that no worker can perform above the level allowed by the system he or she works under. The experiment opens the eyes of all who see it to the “fact” of variation. 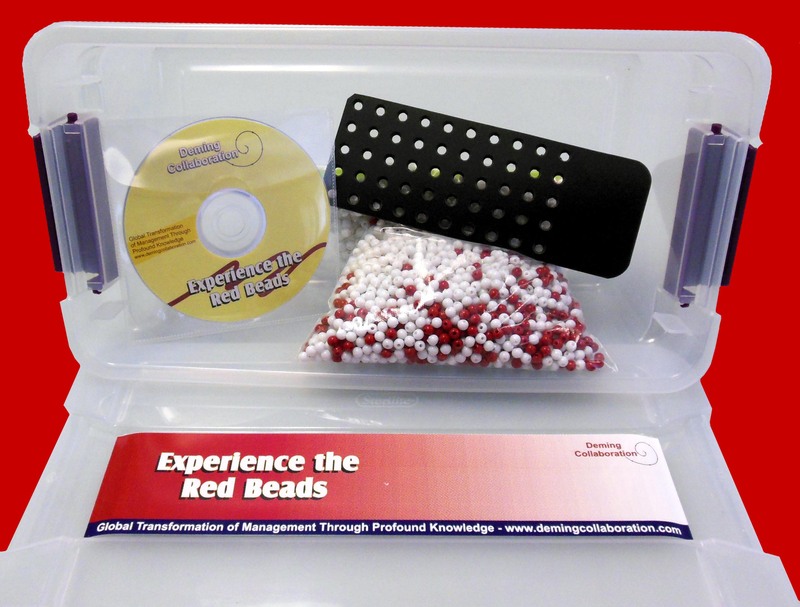 You can buy this quality Red Bead Game from this link. The cost for the game and the companion DVD is $114.90, shipping included in the US. Every new employee needs to sit in on the game as a participant or spectator.